Honestly, Has this man ever held a beer before? LOL! 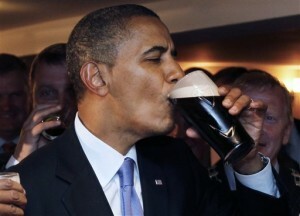 It looks like he is hurting just drinking it…. In he words of this affirmative action POTUS, WTF? What a waste of a good beer. Joplin…how very sad. I work for Sisters of Mercy whose hospital was hit there. It has been a very scary time for all. The weather has been so strange everywhere. Praying for calmer times. I so love the way you have with words…there’s nothing to add! Hey now, lol, I hold my glasses where my pinky curves a bit too! Yes, I’m originally from Missouri, and kept waiting to see if I was gonna get a call about anyone I knew. My friend’s boyfriend is from there, and they had to go back to dig through the rubble, but at least they had not been there are the time! So tragic, the photos all look like some disaster movie. The cowboys are in Kansas riding buffalos!!!! Girlfriend, you are the best! I love all the comments too. I just read another blog with tears in my eyes and I pop over to yours and start cracking up! I would imagine he has more class in his little finger than you have in your whole body. Have a blessed day! Guinness being wasted, he looks so phony and the Republicans are going to dither around and give him the Presidency for another 4 years. I don’t think any cowboys went to the university of chicago..nor studied social justice. Pretty sure they had better things to do. p.s. can A wear a size 3t or what? Those dresses are almost gone!! Ronald Reagan is SO missed!